Welcome to the Real Estate Investing Mastery podcast. Today’s podcast is also available as a video… see link below. 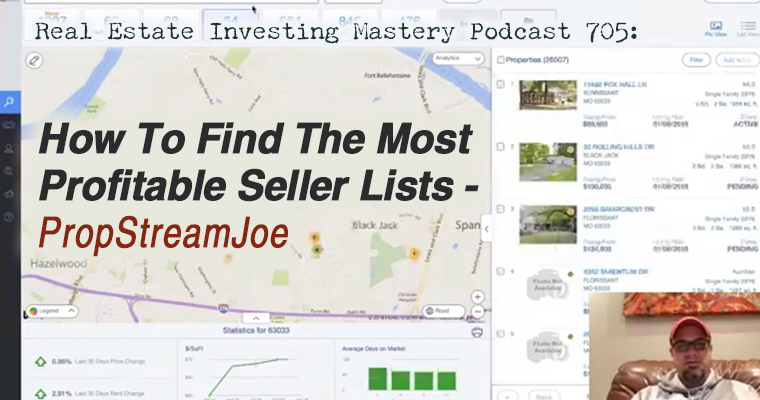 Today I am talking about a tool that will help you find the best lists to market to. It provides MLS data, does skip tracing and more. PropStream is $97.00 a month, which is an excellent price for what you get. Input an address and PropStream gives comps, transaction history, ownership and liens, estimated monthly rent, occupancy, estimated equity, etc. It also provides names and addresses of cash buyers who’ve been active in the area. So once you have a contract on a property, you can start marketing it to buyers. Use my PropStream link and download info at a discount. Hey, what’s up guys? Joe McCall, how you doing? Today is a beautiful day in St Louis. I’m going to show you some pretty crazy pictures here in a minute. First, I want to let you know what this video is going to be all about. I’ve got a special, cool little tool I’m going to show you that’s going to give you the best lists to market to vacant properties, free and clear properties, high equity properties, properties that have liens on them, bankruptcy, divorce, whatever you want in any part of the country that you want them in, and you get incredible data for this stuff to get MLS data for all major markets in the United States and crazy, awesome this tool is only $97.00 bucks a month. I used to pay $400, $500 dollars a month to get the same data using RealQuest Express CoreLogic list source data tree. I’ve tried all of them. Melissa Data, this by far is the best and I’m gonna show you how I use it and how you can use it to. Um, it’s pretty slick, it’s pretty amazing and it’s not for everybody. Um, if you hate money, you may not like it and that’s totally cool. But uh, I like it a lot. I’m going to share some stuff with you here and uh, see if you can see it all. Now, first, there is a huge snow storm right now going by in St Louis and it’s not a big deal maybe to some of you guys up north in Michigan and Ohio, Illinois, Chicago area. But uh, this is insane, there’s a huge winter storm rolling through here. One website says we’re getting six to nine inches. Check this out. This one’s saying we’re going to get up to 13 inches of snow. And this is what the roads look like. Like you want to see something crazy? Look at this radar. First of all, it’s like there’s St Louis right there in the middle. We’re getting tons of snow. Look at Google maps. This is traffic, okay? Like our roads aren’t normally red their normally green. This is what the traffic looks like right now on the roads in St Louis. This ladies and gentlemen is why I love this business, I’m sitting in a lazy boy right now, sitting in a lazy boy. Uh, in my offices is upstairs. We have the separate carriage house. My house is right over there. I have a clean bathroom right there. The coffee is fresh and clean and really good. Like, I love working from home. I would be dying I would be having a mental breakdown right now if I was stuck in that traffic. Oh Wow. Now, okay that’s not why you’re here. I just thought you would want to see that. Uh, go get, go check this out at PropStreamjoe.com. I’m going to show you how to get this cool stuff here. Okay, PropStreamjoe.com. I’m going to log into my account. I have an account with them. Oh, look at that bad gateway here I am trying to demonstrate. That is not working. Oh, okay. That was embarrassing, but it looks like it’s working. It really does work. I swear. Um, it also does skip tracing, so I’m just going to show you real quick, not waste much of your time. One of my favorite zip codes 63033. It’s in the northern, North County, St Louis area. Um, and so what it’s got its got about 26,000 properties right now and uh, right here from this list, I can go in and pull up 846 properties that have liens on them. These could be county tax liens, federal tax liens, HOA Liens, pretty cool stuff and some of these have just been placed within the last few weeks. This property in particular just pulled it up. It’s an owner-occupied property. Look at all this data you get. I’m telling you, this is just, this is for 90. This is a $97 a month product. It’s pretty crazy. Now, what you can get with some of these properties, if you just click on one of them, you know what? Let’s look, let’s look up an example real quick. I’m going to go to the Zillow and I’m just going to look for a property in this zip code. And uh, some of these are pre-foreclosures by the way. I’m seeing a lot more pre-foreclosures right now and are in and around these parts. Okay? Here’s a nice-looking house in this area, good rental property, right, and there’s for sale by owner right now. I’m just going to copy that address. I’m going to put it here in PropStream. I’ll show you real quick kind of data that you can get from this property. They’re estimating this property has about $75,000 in equity. Pull it up. I see that the occupancy is vacant. It’s a corporate owned property, so it’s an absentee owner. How do we know it’s an absentee owner? Well the mailing address right here is different than the property address is. There from Houston, the owners are, and it’s from a, it’s opposite of properties in St Louis. Now you can give some good information about this like the transaction history. You can see when it was last purchased, it’s like there were some deed transfer from Charles Jones to New Realty and see if there’s any mortgages on the property, there was a mortgage recorded in 2009 for $66,000 bucks. Here’s the tax information on the property. Um, comps. Comps are really good it pulls it from data, county data. But it also pulls it from the MLS so you can go in and say, show me the comps in the last six months, last 12 months, Cetera, and you can also then compare it to the MLS data within a half mile, same bedrooms and stuff, and you can sort this list and get… these are comps are actually really, really good. If you get to get this property under contract, you could say, show me all the cash buyers that have bought property in that area. There’s boom, all the cash buyers. So, there’s a lot of good data you can get from this. The estimated value the last time it was sold and the sales price, if there’s a sales price there, um, offer, the estimated equity, the estimated mortgage balance, the estimated monthly rent, all of this stuff, it’s included. I used to pay guys literally right now if I go click print, I used to pay a $150 a month just to get this property data that I’m getting from $97 a month with PropStream. But I haven’t even showed you the best part yet. So, this is a PDF, so if you have a VA that’s pulling in these properties for you, VA can put, attach one of these. This is an eight page PDF of everything you need to know about the property, the last market sale date, the mortgage, the data, who owns it, what the address is, when was it last sold, prior loans or any liens, ownership history, listing history from the MLS, comparables, actives and solds and pending’s and expireds from the MLS and then market data on the accounting is the neighborhood and stuff like that. Cool, right? Like just the property data alone is amazing. I can do this from anywhere in the country houses or vacant land, commercial properties, all that good stuff. Because let me just show you something. Let’s say I want to target uh homes in 63033, if I can do this, I want to send them some marketing, all right. I want to send them some direct mail or I want to skip trace it and get some phone numbers. So, what I’m gonna do is I’m in 63033, um and I want to pull up liens, right so I can pull up pre-foreclosures too, by the way, get pre-foreclosures here. There are 68 properties in this zip code right now that have a notice of trustee sale. So, these are pre-foreclosures. I can take this list and export it and it’s gonna give me not just the property address but the owner’s mailing address in that export in spreadsheet. By the way, if you use my link, you can export up to 10,000 records a month, which works out to be one penny per record, right? If you were to go sign up with ListSource, you’d be paying 20 to 30 cents per download. Some of you guys get lucky. I do have an account with ListSource where I can export 3 cents per record, but this would be 1 cent if you’re doing it. Um, and if you use my link, you can export up to 5,000 in one day, 10,000 in a month. I mean, if you use the normal PropStream link, you can only export I think 500 a day. With mine, they changed, make it special for me. You can export 5,000. So here I could get 68 pre-foreclosure properties. I can pull up a 846 properties that have liens on them. High Equity, um, there’s a, there’s an option here for high equity and free and clear they are different, so I’m not sure yet how it works out, but these are properties that have a lot of equity, 1,387. Uh, here’s a list of vacancies they pull vacants from different data sources, but one of the main ones is the US Postal Service. Um, so these are vacant properties. There’s 476 in that zip code. There are 6,000 properties that are free and clear. Did you know that according to the US Census, that one third of all homeowners in the US do not have a mortgage? So there’s 6,000 free and clear properties. I can also pull up bankruptcy’s or 633 properties in the bankruptcy right now. And you could also sometimes pull up divorce. Now it’s not, I don’t know how accurate this is, but they say that these four properties right now that have been going through divorce or something like that. Auctions, I’m not sure what that is or how they get that. But um, so this is what I would do. What I’m just going to show you, like one of the favorite things that we’re doing right now. We’re doing anywhere between 5 to 10 deals a month down south in Alabama and Mississippi. I’m cold calling. We’re cold calling but pulling lists. Um, we’re, we’re putting them into our auto dialer, and we have VA’s in the Philippines that are making cold calls and when we have boots on the ground, the wholesaler that’s calling everybody, right? Um, so we like to cold call, cold calling works, but you can also mail these lists as well. So, I’m just gonna show you what kind of lists that we are pulling and skip tracing using PropStream, okay. If you go here to filter, um, we like targeting absentee owners with equity, that’s our first list that we like to target. Okay. So, I’m just gonna go to owner occupied, no, I’m going to say single family for property type. Now if you want to, like if you’re doing lease options, you might say I only want minimum three bedrooms or more, right? Um, so I’m going to go to ownership info. I want to target absentee owners that have loaned it. They didn’t just recently buy it. I want to make sure they’ve owned it for at least five years because maybe within five years they’re more likely to have some motivation. So right now, it’s on auctions. I’m going to go high equity. Um, so in this zip code, um, there are, uh, let me finish this here, um I could say only show me out of vacant, I mean out of state owners, only showing properties that are vacant and I want to make sure I’m not targeting like really expensive homes. So, I could go in here and I could say undervalued trend. I could say I’m only showing me the houses that are at least, um, well I want to show the estimated value are under $200,000, but I just want to make sure I’m excluding properties that might be really big or you know, I don’t want to target the expensive homes. Cool. There you go. So now under high equity, I have 137 properties where they’re absentee owners. Oh, you know what else? It’s really hard to skip trace LLC’s and corporations. So, I’m going to go in here to owner info and I’m going to say owner type individual. So, these are only individuals that, uh, are absentee owners that own a single family that have high equity, that have owned it for at least five years. There’s 105 there. Cool. But now that’s not all I can go in here and say, all right, show me all of the ones that are absentee owners that have liens on the property, or what do you think? Do you think that might be a good list? Here’s an HOA lien on this property. Let me just click it here. This is a property on Willow Trail Black Jack. It’s a good rental market. Non-owner occupied is about 20 grand in equity on this deal and it was last sold in 2013. The lien details, so this is somebody that lives somewhere else in St Louis and it’s an individual owner. It’s not an LLC, in lien details there’s an HOA of $400. Now it’s not a big deal, but usually 9 times out of 10 if a $400 HOA due can’t be paid. It’s not like it, it’s not, it’s like a few days late. So, they put a lien on the property. It’s usually, it was like a year late. It’s not getting paid. So, liens are a great indicator of potential motivations. So, what I’m trying to say, go in here and I can see the loan history on the property. So, five years ago there was a loan on it. It looks like, um, and here’s some tax information and here’s some comps and things like that. Cool. Um, now I can also go in here and filter. I want vacant. These are absentee owners, owned it at least five years. Oh my gosh. Do you think this would be a good list to start calling? Maybe sending some yellow letters to, these houses are vacant. How about free and clear? Ooh, this is a good list. Now, sometimes the best list to mail to if you’re doing handwritten postcards would be owner occupied, free and clear properties. I’ll show you that in a minute here, um bankruptcies. There was 276 in a free and clear. There’s 47 properties and bankruptcies. Now I’m going to clear this search real quick and go back here to 63033. Let’s say I want to do a handwritten postcard. If I’m gonna do a handwritten postcard. Um, I like to send it to owner occupants with equity. Well, let me show you how I will do that. I’m going to owner occupied. Yes. The property characteristics. I only want single family homes. Okay. Um, and list type I’m going to go to two of them, but let’s just do free and clear for them. So far 330. I want to go here to MLS status. I mean I could go into MLS status and just make sure I could target active properties that are actively listed and maybe offer them owner financing. Let’s just look right now. If I were to go right now in the MLS, there are 17 properties that are listed for sale in the MLS that are free and clear. What if I sent an offer for owner financing? I’d pay them their full price with owner financing, and I send a letter to the homeowner. Now, if you’re not licensed as a realtor, you can do that. They could also say, listen, I want only on the market for at least 90 days. Let’s see if there’s anything in here. These are homes in this one zip code that are free and clear, actively listed on the MLS that have been on the market over 90 days. So maybe the seller is getting a little motivated. Ooh, what if I offered them owner financing? Full price? Now you may want to make that offer through the realtor. I would prefer to just send a letter to the homeowner and see if they would accept it. Now I’m not trying to kick the realtor out of the deal. It’s a great way to get your foot in the door. That makes sense. Um, so let’s just remove the MLS here and I just want to show you what, if I was going to do some direct mail to a, uh, this zip code for free and clear. This is what I would do. Um, so it’s. This is a single-family ownership info. I only want them to have owned it for at least 15 years. Why? Because they’ve owned it for 15 years and it’s free and clear there’s probably some delayed deferred maintenance, deferred maintenance, a kitchen probably needs updated, you know, the roof probably hasn’t been replaced in a while and it needs updating. So, there’s a lot of work that needs to be done. There’s a lot of equity, a lot of work to be done. A recipe for profit. Okay. This is beautiful, isn’t it? Um, and value trend. Let me equity mortgage. I’m already doing free and clear so I don’t need to worry about percentage, but I can do percent equity if I want. Um, and I can even, just, by the way I know I’m jumping around, but like if you want to target homeowners that have FHA or VA financing for lease option deals, if you’re looking for deals that have only a little bit of equity, you can target FHA and VA loans right here. I don’t know how that works, but here you go guys. Here’s a list of 213 people and I will do this in each zip code that I’m targeting, uh, that are free and clear, single family home, they owned it at least 15 years and it’s priced between $100,000 to $300,000 and it rents for at least $900 a month. That’s fantastic. Now, what if I wanted more than 213? I could go to ownership info and I could say? Well, they, I want them to have owned it for at least 10 years. There’s 541. I’m telling you guys, you can take this list. Then you can export it to a spreadsheet inside of PropStream. You could even skip trace that list if you want. I’m not really tested that yet. I use this other service that I like a lot for skip tracing, but there you go guys. This is an amazing list that you could start cold calling, you can start sending direct mail to, um, and then once you even find a property under contract, you can come in here and say, all right, show me all the investors that have bought property in this zip code in the last year that are out of state investors and it’ll pull you all of that in. And so, let’s say I get a property under contract in 63033. I hope you guys can still see me by the way. It looks like we’re good here. All right, I’m getting comments. I will be at Funnel Hacking Live. So, you guys, if you have questions, comment down below. And then after I’m done showing you this next thing, I’ll go in and answer your questions. Okay? Um, now let’s say I get a property under contract in 63033 and now I want to find some buyers that I could maybe market to 63033. I want to find recent investors that have bought here. So, I’m going to go to owner occupied. No, I’m going to go, I want only investors that bought. Well, I’m okay with the condo, single family or multifamily, right? Um, and I’m going to go to ownership info. They’ve owned it no more than a year. Does that make sense? Oh, this is beautiful. Look at this. 491 properties in the zip code that had been bought by an investor in the last year. That’s pretty cool, isn’t it? You want to know what I would send them? I’m going to show you what I would send them here. Let me go into my um. Well, you know what, I’m not going to pull it up because it would. Yeah. You know what? I will hold on one sec. Oh, I should have prepared for this. I would send them a yellow letter. And this yellow letter. Let me, uh, let me come back here. So, want to show you something so cool. And there’s two things I would do. Number one, I would download that list of 400 and something investors that have bought a property there in the last year and I would send them my desperate motivated buyer yellow letter, and I’ve done this before, and it works like insane crazy. You Ready? Want to know what it is? I would write them a letter that says, help urgent. I desperately need to sell my property at 123 Main Street, St Louis, Missouri, 63033. I desperately need to sell my property asap. I’ve had it listed for some time now. I can’t wait any longer. The taxes are paid. The title is clear. I need this thing sold today. Underlined everything right. Please, please take a drive by look at it and call me. Thanks, Joe. Right? Then you know what I would do? I would crumble that letter up. I’m telling you this is crazy, but it works. Crumple the letter up. Open it back up again. Fold it, put it in an invitation, envelope hand, write on the envelope, the name of the buyer. Put a live stamp on it and send it. Now you don’t have to do this yourself. I used a stay at home mom that worked, that was married to my acquisitions manager at the time we used. You can use a stay at home mom and your kids, a disabled vet. Find somebody that can hand write these letters for you. It works like crazy. Twenty percent plus response rates. Okay? You only have to send 100 to 200 for these it for it to work. Okay. And then what happens is so funny. I’d get calls from these guys saying, hey listen dude, I love that letter. I’m not interested in this property, but I just wanted to let you know I love that letter and I’m going to use it. Is that crazy or what? So, I’m also going to send…. I’m going to show you right now a great bandit sign to use. Um, when you’re selling one of these properties, you want to see a really cool, my favorite bandit sign? Um, I’m going to look in Google drive here cause I have it in drive. Um, hopefully I can find it… Just ahh, here it is. Are you ready for something super cool? All right let me show my screen. Oh, look at this beauty. Look at that beauty, this thing works like insane crazy. It’s different, right? It’s not just in, you know, it’s not just saying cash buyers needed or foreclosure. Well it says this? Please help me. Boop, exclamation point. I need to sell my house. I’ll take anything. You think that’s going to get some phone calls? So, guys, just think outside the box, okay. 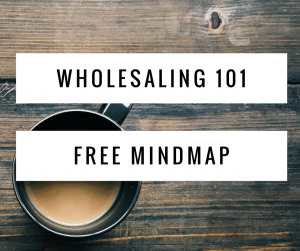 Think outside the box and get ya some sellers and buyers. Listen, let me show you my thing here. Go to PropStreamJoe.com, PropStream is absolutely amazing. I, I sign up for it, I pay for it. Yes, that’s an affiliate link, but you’re going to pay the same either way whether you get it yourself or not. And if you use my link right there, they will let you export up to 5,000 in one day, 10,000 a month. Thanks Jonathan. Appreciate it. Yes, this chair looks really comfy. Um, it’s my, my office is normally upstairs where I do my videos. I’d just like to come down here and do these, it looks a little more relaxed. Um, will you be at Funnel Hacking Live this year? Yes. So, I’ll be there. If any of you all are going to be in Nashville in about a month from now a, uh, shoot me a message on Facebook messenger or something like that. Um, I would love to say hi. Loving your courses. Thanks Jonathan. You guys are the only ones posting stuff here. So those are the only questions and comments I have right now. But listen, go get PropStreamJoe.com if you want to get, um, if you like money, if you hate money then don’t worry about it. But I use this all the time. I know you’re going to get a lot out of it. Um, it’s pretty amazing and if you don’t like it then just cancel it. There’s a seven-day trial. They won’t let you export more than like 50 at a time. If you’re still within the trial period and you’ve not put in your credit card yet, so don’t think you can just go in and do. I don’t think that you can go in and download thousands of records during your trial period, it won’t let you do that. It’s pretty cool. I’m going to be doing more videos about this, showing how I use PropStream. One of the cool things that you can do with PropStream that I didn’t talk about is, um, you could go in and you say, all right, can you show me all the absentee owners? In fact, let me just show you. This is so cool. You don’t mind? Do you want me to show you this, this, this, and this? I can say, all right. I just, I bought a property in 63033 and I want to find people who are rehabbing a house that bought a house in the last year and its currently actively listed on the market. This is a rehabber, right? So, I could go in here to filter, like I can say, all right, show me owner occupied, is no. Property characteristics. I can say just single family, um, and ownership unfold. They bought it in the last year. All right. And I’m going to go here to MLS status and I’m going to say active. What does this mean? I wonder. I’m glad you asked. And I could also go to MLS sold, well not sold yet, don’t worry about that. Just actives. Here’s a list of 27 properties right now. Well this may not be right cause I’m looking at this here. I might have messed this up. Let me uncheck active. Check it back. Okay. Yeah, you have to check this because here’s the cool thing. These are properties now that have an investor bought it in the last year and it’s currently actively listed on the MLS, which usually means it’s been rehabbed and now they’re trying to sell it. Let’s look at this example. This is a property that US Trust, it’s a bank, US Bank Trust from Oklahoma bought it, they foreclosed on it, but it’s back on the market now and let’s see if they put any work into it. I’m trying to look at the pictures here. So, this isn’t rehab, so I need to figure that out. Maybe I don’t know what I’m doing, but um, yeah, you can go in and you can say, all right, show me the properties that had been purchased and now active on the MLS. And those might be rehabs, maybe not. Cool. Alright. Um, let’s see here guys. Go get PropStreamJoe.com and check it out. All right guys, that’s it for now. I’m out of here, there’s hot chili. I’ve got to trudge through the snow about 15 feet to get over to my house, it’s so weird I have to point like this because my house is that way. It looks like it’s that way for you guys. We’ll see you all later. Take care. Bye. Bye.